Post-New Orleans I’ve spent the remainder of this February 2015 travelling through the sunshine state. I drove the VW east from Louisiana along the gulf coast into Pensacola and through Apalachicola and Tallahassee, eventually arriving in Tampa Bay to visit my friend in Clearwater. 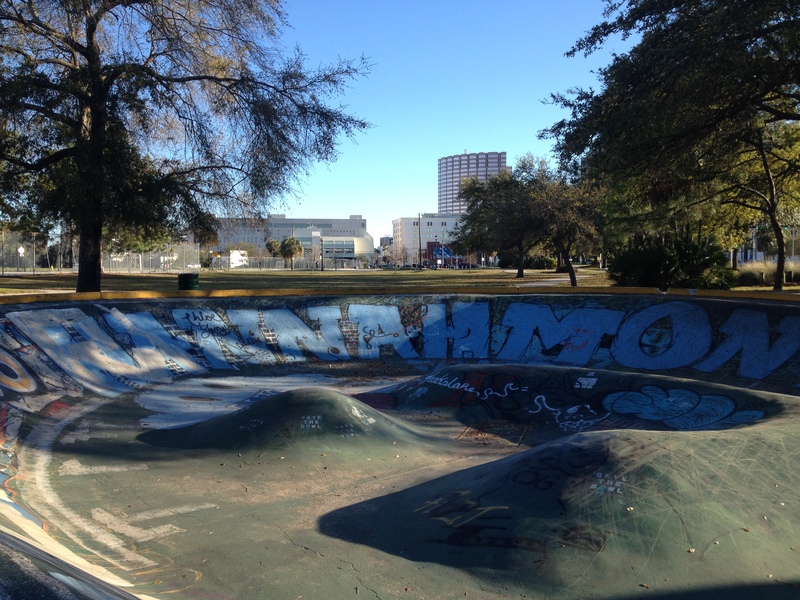 I hadn’t been to the Tampa Bay area since ’98 when I came down here on a skating tour to visit Tampa’s famous skatepark ‘The Spot’. While exploring the city, I revisited a favorite skate-landmark called ‘The Bro Bowl’, a serpentine run into a five-foot-deep bowl that was poured in the late 1970’s. It’s still a joy to skate, one of the free-form concrete old-school pours preceding the cookie-cutter and Masonite designs that exploded across the country in the 1990’s. Regrettably, the Bro Bowl, once located in a tough neighborhood in East Tampa, will be destroyed in the very near future to make way for gentrification, a condo complex, and urban renewal, etc. However, the city has promised to build a replica of the bowl a mere couple hundred yards from where the original one stands. A piece of classic skateboarding history will be lost; I’m glad to have skated it once more before it’s gone. While staying in Clearwater I designed a fresh logo for my friend Ryan “Landshark” Clancy’s clothing company “Nightbreed Nocturnal Apparel”. Ryan is a mainstay in the Western Florida EDM (electronic dance music) scene, as well as an indomitably creative entrepreneur. I’m looking forward to wearing a first-edition print of my design on one of his tees and to further Skribblefish/Nightbreed collaborations in the future. Clearwater is just a stone’s throw away from Saint Petersburg, where I spent a couple days digging the scene and documenting the mural work. On the reverse of the bars and boutiques that line St. Pete’s Central Ave. there is a two-block long string of highly impressive mural work by local artist Sebastian Coolidge, who paints murals of fantasy and whimsy—massive images of the Mad Hatter and a wine-imbibing bicyclist with elongated limbs riding a bike made of vines and flowers. 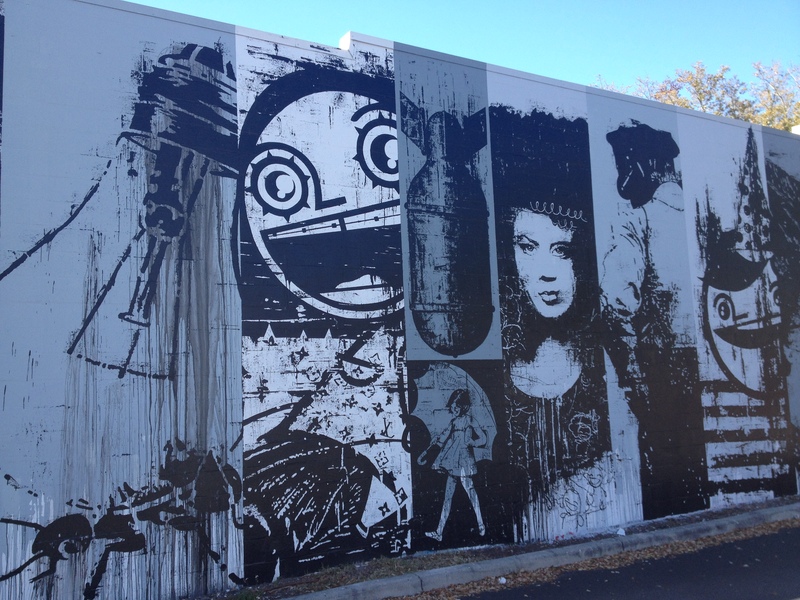 St. Pete also boasts a couple murals by internationally renowned graffiti writer Bask, whose distinct style is a collision of playful cartoon faces and pop advertising images (like the Morton Salt girl) with symbols of war, death and gore. His work can be found in the famous publication “Graffiti World”, a veritable bible of reference for the graf culture. 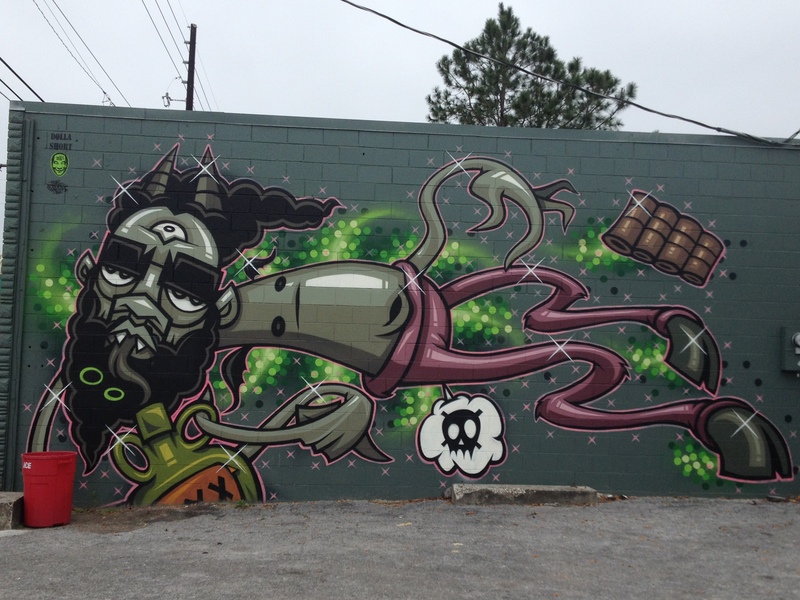 There are also a couple productions to be found in St. Pete by the AM7 crew which features writers from Miami, Atlanta, and LA; their work often includes seemingly alien faces and visages amidst psychedelic nebulas of highly contrasting colors and bold, graphic shapes like bubbles and starbursts. The mural work that I saw in St. Pete generally includes motifs that you might expect of Florida, lots of palm trees, alligators, and orange blossoms, all painted in bright, tropical colors. There is a soothing atmosphere to the colors than the styles that relax into the landscape, a refreshing departure from the aggressive, confrontational street-art which characterizes cities further north. After five days in Tampa Bay, I travelled south to Sarasota and spent a couple of afternoons relaxing on the powdery white-sand beaches of Lido Key. On a Saturday evening I lucked into a reggae/ska show at local Sarasota custom micro-brewers “JDub’s”, who were celebrating their one-year anniversary with bands “Sowflow” and “Bootleg”. After a long night of suds and a good solid sunburn, it was time to head north again to Orlando. Florida, in general, is not fond of graffiti culture, perhaps due to its desire to maintain its appeal as a tourism-centric state; any blight upon the aesthetic of clean, polished, sun-bleached concrete is greatly discouraged. 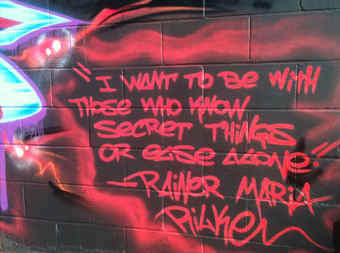 Orlando “struggled” with a substantial graffiti problem in the 90’s and eventually ceded the neighborhood of Mills 50 to street artists, permitting the artwork go un-buffed as long as it had the blessing of respective property-owners. This concession made way for some high-caliber walls by Florida muralists Andrew Spear, Mark Gmehling, Zoer, Riot, Killer Ric, Cem Two, AM7, and Earl Funk. 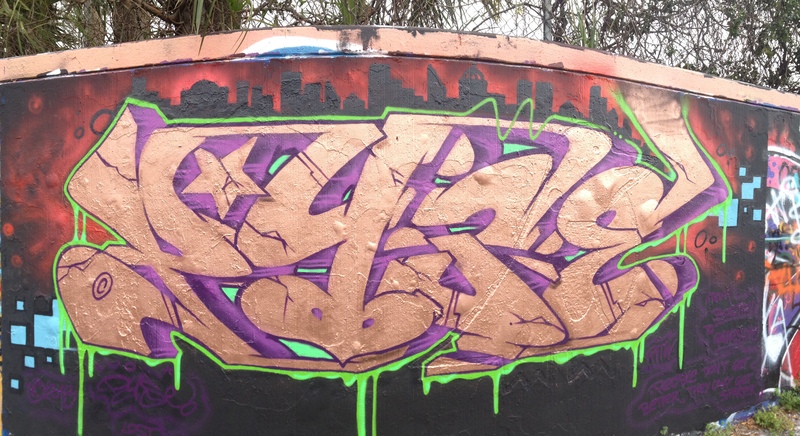 Some of the best graf in the city can be found at Mills 50 Vietnamese restaurant “Pho 88”, which boasts consistent productions by the artist mentioned above, as well as a silver throwie from Brooklyn bomber and NYC all-city legend Skuf YKK. Andrew Spear is holding down at least half-a-dozen productions in Mills and appears to be sponsored by Redbull. His style is often duo-chromatic, geometric portraiture painted in mixed media that includes minute detail in felt-marker. The subjects of his black-and-white portraits are hip-hop scenes, b-boys, and beautiful women set against backgrounds of primary colors in large, saturated shapes. While Zoer, Riot, Killer Ric, and Cem Two paint in the semi-wild letter structure that is ingenuous to the east coast, while including themed-backgrounds and characters into their productions. Their current installation at Pho 88 is a holdover from the holiday season that features a massive Santa Clause by Killer Ric and a foreground of snow and brightly colored presents (not that they know a damned thing about snow in Orlando). After a couple days of pounding the pavement of Mills with my camera and dining on delicious Vietnamese fare, I headed to downtown Orlando. On a mild mid-February evening, I scalped into a ballgame between classic rivals Orlando Magic and Miami Heat at the Amway center. I’d never been to a pro game where half of the attendance is rooting for the visiting team. The game went to OT, but the Heat took it from the home team. The final leg of my Florida travels brought me to the Northwest cities of Gainesville and Tallahassee. 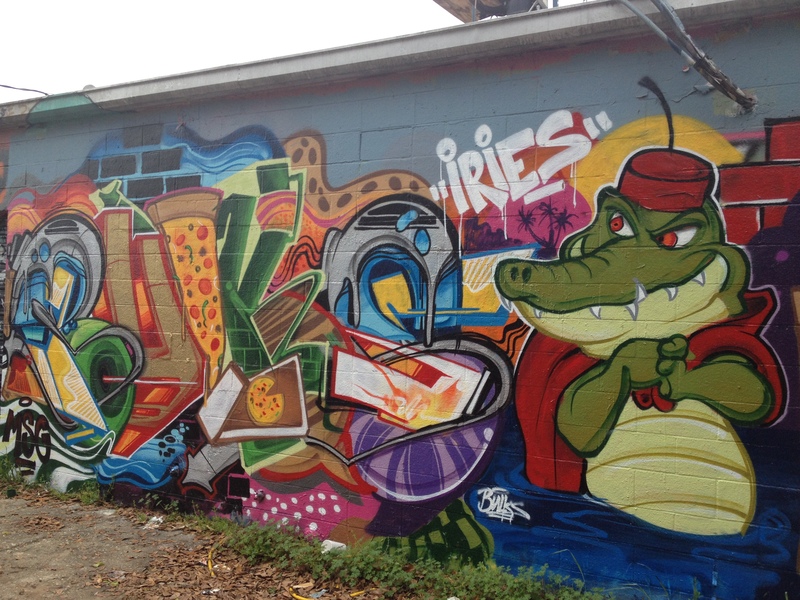 Gainesville is a sleepy college town centered around the University of Florida, who have given over a section of their campus along 43rd St. to street art. The spot is a retaining wall that sprawls over a hundred yards beside six lanes of heavily trafficked road. Unfortunately, most of the wall is overrun by fraternity graffiti and it’s generally used as a kind of DIY bulletin board for the UF kids who indiscriminately paint over good work with poorly executed love-notes, etc. 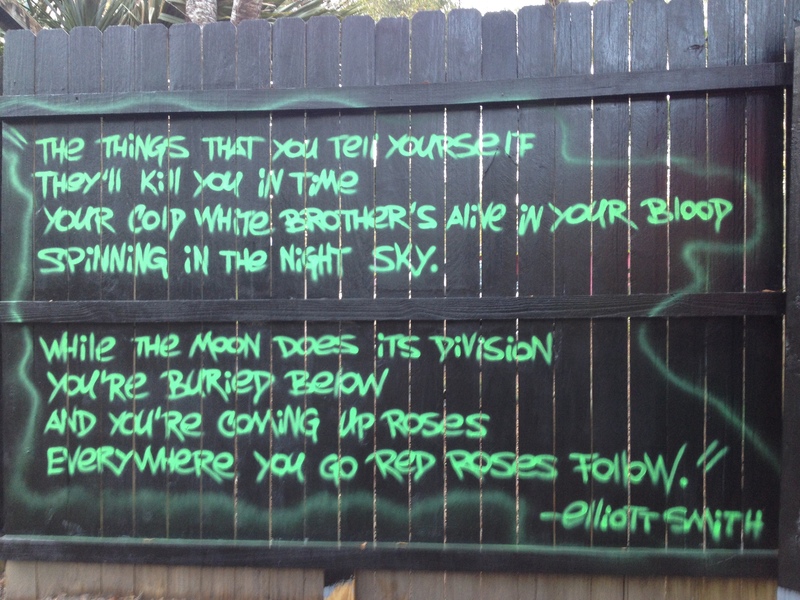 I was told by one local artist that the serious graffiti writers of Gainesville have all but given up on painting there. I couldn’t resist, however, and so I painted a “Copperchrome” burner with a duel-purple outline and a cityscape resting against a fiery “Shock Red” background. I found Hugh, his wife Mary, and their cracker homestead to be utterly inspiring, and by the second day there I found myself walking around barefoot in cuffed pant legs beneath a piece of folk-signage that reads “Take your shoes off Moses your on Holey Ground” (sic). Hugh has built himself a cozy “writing-shack” out of an old camper and recovered local lumber where he plans to work on a new screenplay. The writing-shack looks out on his garden and a Shaker fence that hems in his backyard. I was asked to paint a piece that would co-exist harmoniously with the swampy garden atmosphere, something that he could look to for inspiration and artistic relief while composing his writings. I set to work and created a semi-wild burner that reads “Pyose” and floats a three-dimensional illusion through a ninety-degree inside-corner of fencing. The piece is a cosmic combination of matte-black, galaxy-purple, and astral-blue, accented with starbursts of Easter-yellow and clockwork-orange. It’s outlined with shock-white, 3-d in London-grey, and “roped-off” with a perimeter of acid-green/shock-green. 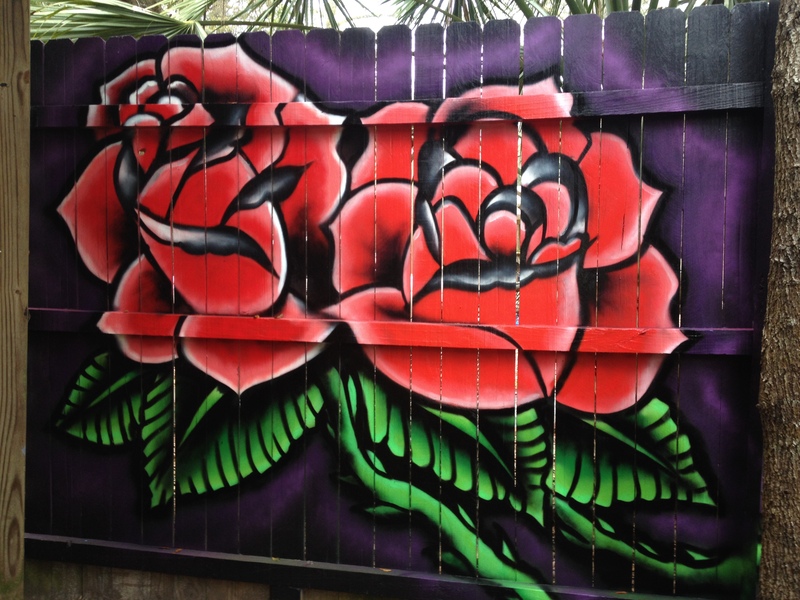 The mural also includes a panel of tattoo-style red roses growing on lawn-green vines that extend around a ninety degree out-side corner and enter the ground of the garden beneath the burner. Hugh was ecstatic with my new addition to his collection, which he plans to showcase at his upcoming annual culinary gathering, “South Pork”. On my final day in Florida, I drove to downtown Tallahassee and dropped a dead-letter piece on the back of St. Michael’s Bar. It’s a quick silver-and-white-number with a vampire-purple outline and magic-black shadow effects, roped off with a pair of drippy blue tones. I always identify myself as a Boston artist when painting in other cities; this piece includes the famous Red Sox slogan “Reverse the Curse”. 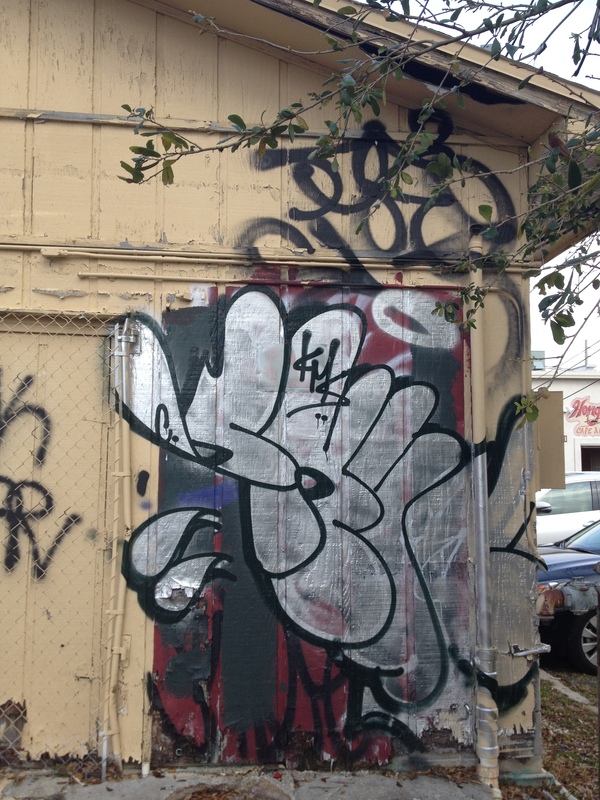 Other writers who currently grace St. Michaels include Miami-based “Bulk” and Tallahassee mainstay “Bugsy the Saxon Pusher” who’s been writing since ’69 in his old-school, impromptu style. All in all, Tallahassee was a magical experience and one of the highlights of my travels in the south. My thanks go to the Taylors for their hospitality and the inspiration that they’ve brought into my travels. For now, I’m headed back to Atlanta. Cheers. This entry was posted on March 8, 2015 by dannydiamond117. It was filed under Uncategorized .